15 pc. Carbide Forstner Bit Set, 5/16" - 2-1/16"
Roman Carbide DC1916 - 15 pc. Carbide Forstner Bit Set, 5/16" - 2-1/16"
These Roman Carbide Forstner Bits are some of the nicest Forstner bits available! Micro-grain carbide cross tips and center cutters stay sharper longer, for years of dependable service when drilling hard and soft woods, face grain, end grain, and figured grain. 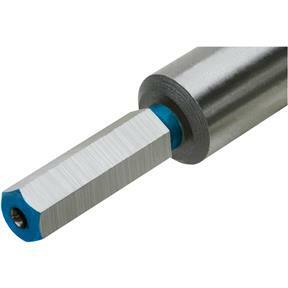 Carbide cross-tips and center-cutters also provide smoother, chatter-free, and faster cutting results. Hex shanks guarantee no slipping, unlike round shanks, which result in scarring and diminished accuracy. Hex shanks fit 3/8" drill chucks. 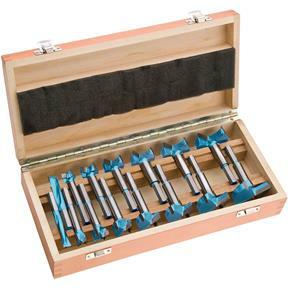 Includes 5/16" through 2-1/16" Forstner Bits in 1/8" increments. It took two tries to get it right. The first time I received the bit set they had rattled around in their supposedly fitted box so much that over half of them had chipped carbide. Grizzly gladly offered to replace them and provided postage to return the damaged bits. The new set arrived and is in good condition. There is a serious deficiency in the "fitted" box - it doesn't really hold the bits in place through the rigors of shipment. I haven't used the bits yet, but they look like they'll work great. Also ordered the 1917 set to get all 1/8" sizes. These work great. Appear to be very good quality. Cut fairly fast and make very smooth holes. I have a few individual forstner bits so I finally broke down and bought a set. These are pretty good bits. Not very sharp out of the box and do not leave a clean sidewall cut. I love my forstner bit set! The bargain price was unbelievable. The quality of the bits is fine. No complaints there. I guess I didn't read the breakdown of the sizes as I was excited about the sale price. My complaint is that this set has no normal sizes. They are all something & 1/16. So no 3/4, 1, etc. It is almost as though this set is meant to be a companion set to something else and it just may be my issue for not reading the description more closely. If you are ok with that, then purchase. If not, pick another set. Excellent set. Used them immediately and they were as good as advertised.